Traditionally it is known as one of London's most notorious red-light districts, but times are changing in King's Cross. Next year it will become Britain's gateway to Europe, a 24-hour international arrival point - thanks to the new Channel Tunnel Rail Link terminus at St Pancras. And draft £2bn plans to transform more than 67 acres of former railway land - one of Europe's biggest inner city development sites - go before Camden Council this week. 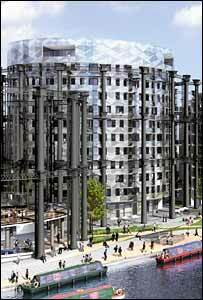 Modern flats and play areas could be housed inside the iron rings of the huge gas holders, a reminder of King's Cross's industrial heritage. By 2020 new streets, parks, offices, shops, restaurants could be built on a site stretching north from St Pancras and King's Cross stations up to the Islington border. Planning-wise, the area is not without problems - criss-crossed with railway lines and the Regent's Canal. "It's a big hole in the fabric [of the area]...the railway lines are a barrier," said the council's man in charge of overseeing the project, Bob West. "The surrounding populations and pieces of land are a bit fragmented, and there are levels of deprivation." 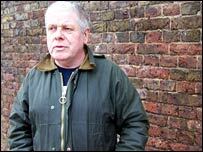 Mr West's team have sent out consultation leaflets to 30,000 homes - twice. More than 300 community groups have been contacted and planning briefs have been worked out with neighbouring Islington Council. If all goes to plan, detailed planning applications could be submitted by Christmas. There's so much interest, councillors are to examine the draft plans over two days, on 8 and 9 March, to allow various deputations to have their say. But not everyone is pleased with the plans as they stand. The King's Cross Conservation Area Advisory Committee (KCCAAC), a small group of volunteers, have raised £750 and called in some favours to produce their own report. They say opening up the canal walls will shatter the tranquillity of a towpath now used almost exclusively by cyclists, joggers and herons. And they fear huge office blocks will overshadow the area's Victorian heritage, that historic stations and old buildings will be bulldozed, and an "office world" created south of the canal. How is it King's Cross anymore if it's just a bunch of offices like you would get anywhere?" Spokesman Rupert Perry's main priority will be saving the unlisted 1890s Culross building which sits at right angles to the developer's proposed line of offices. 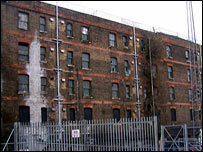 Its 40 or so flats look shabby now, with broken windows and stained bricks, but Mr Perry thinks it has great potential. "They could easily be converted back, either for fancy housing, or social housing," he said. "Basically [the developer] wants to destroy everything south of the canal on his side so he can pile it up with offices, it's just a missed opportunity. "How is it King's Cross anymore if it's just a bunch of offices like you would get anywhere?" Roger Madelin, chief executive of the developers Argent Group, disagrees, saying most reaction to the plans had been positive. He says several buildings are being retained, such as the old Granary Block, and believes suggestions to keep the Culross building would not work. And he says the mixture of businesses and facilities is "appropriate for a 24-hour a day international arrival point". He added: "I see the whole area being changed, not completely because there are some very fascinating aspects to it. What we want it to be is clean and safe, but urban and gritty." They have a head start already. A side effect of playing host to hundreds of Channel Tunnel Rail Link builders is areas once considered "a bit dodgy", are already changing. "Almost inevitably the construction works have meant that a lot of areas that were convenient for some of the activities King's Cross was famous for have disappeared," said Mr West. "King's Cross now is one of the safest places to go to. Considerably safer than it was - I think that [its old reputation] will never come back."